Summary: With the help of a courageous fellowship of friends and allies Frodo embarks on a perilous mission to destroy the legendary One Ring. Hunting Frodo are servants of the Dark Lord, Sauron, the Ring’s evil creator. Of Sauron reclaims the Ring, Middle-earth is doomed. For science fiction fans ‘The Lord Of The Rings: The Fellowship Of The Ring’ was the beginning of an epic journey, for film fans this was the beginning of a franchise that would change the cinema world forever. Many doubted that director, Peter Jackson would ever be able to bring the classic work of J.R.R. 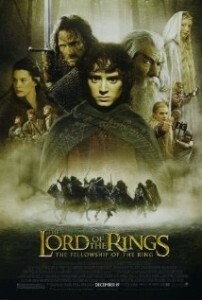 Tolkein to the big screen, but he did it and created history along the way. ‘The Fellowship Of The Ring’ is the first film in ‘The Lord Of The Rings’ series at sees aging wizard Gandalf (Ian McKellan) realise that the power of a very special ring is starting to get the best of a curious hobbit called Bilbo Baggins (Ian Holm). Gandalf asks young hobbit, Frodo Baggins (Elijah Wood) to look after the ring but when it is soon realised that the evil Saruman (Christopher Lee) is raising up the dark forces and is desperate to gain the ring Gandalf instead decides that it is time for Frodo to go and destroy the ring in the fires of Mordor. Soon Frodo is joined by the likes of Samwise Gangee (Sean Astin), Peregin Took (Billy Boyd) and Meriadoc Brandybuck (Dominic Monaghan) on a journey where they need others including Aragorn (Viggo Mortensen) and Legolas Greenleaf (Orlando Bloom) to protect them. But with danger at every corner and never knowing who to trust this is never going to be an easy journey. Peter Jackson draws in the audience from the very beginning. Normally in a franchise you would never expect a main character to die in the first film, but Jackson shows very early on that that isn’t the case with ‘The Lord Of The Rings’. Both Frodo and Gandalf’s lives are put at risk on a number of occasions and as a result you are kept on the edge of your seat. Jackson also captures the landscape of New Zealand remarkably well and despite this largely being an action film you can’t help but marvel at the beauty of the film. He also uses that same creative eye when creating some of the ‘creatures’ that appear on screen and despite a couple of dodgy moments it is easy to see why this film was ahead of its time when it comes to special effects. Despite being such a monumental however ‘The Fellowship Of The Ring’ does have its downfalls at times. With so many characters being introduced in this the first film it is at times difficult to keep track of who-is-who and it is a little disappointing that you don’t get to learn a little more about important characters such as Aragorn and Legolas. It’s hard to care for them during battle scenes when you haven’t really been told that much about them. ‘The Lord Of The Rings: The Fellowship Of The Ring’ is an epic movie of every scale but it is a film that Peter Jackson should be extremely proud of it as it was a fantastic way to kick off this series of films, and despite being the first of a trilogy the audience certainly doesn’t feel like they haven’t been taken on a journey by the time the final credits roll.